Medscheme, a subsidiary of AfroCentric Health, received top honours for service excellence in medical aid administration and managed care at the Board of Healthcare Funders' (BHF) Titanium Awards event, recently held in Cape Town. The Titanium awards recognise excellence in healthcare and form part of the annual BHF industry conference. The award process independently assesses industry players based on a number of service-related criteria, including efficiency, innovation and member experience. Medscheme received top awards for service excellence in health administration as well as managed healthcare. In addition, Medscheme was also awarded the BHF Member of the Year award. 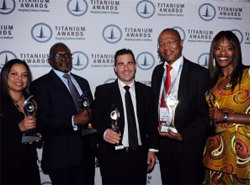 Bonitas Medical Fund and the Old Mutual Staff Medical Aid Fund, both Medscheme administered clients, received the Titanium Award for Service Excellence to Members of Open Schemes, and the award for Service Excellence to Members of Closed Schemes, respectively. Receiving the awards, Medscheme CEO Kevin Aron said: "Service excellence is something we have worked hard to achieve and we are extremely honoured to receive these prestigious awards. They reflect our commitment to providing the highest quality, innovative service solutions for our clients." Aron also commended the Medscheme staff for these achievements and recognised that it would not have been possible without their commitment, dedication and hard work. "These awards confirm that we are on the right track in dealing with major healthcare challenges as well as in meeting and exceeding the expectations of our clients and their members," concluded Aron.